A unique contribution to the archaeological literature on the Southwest, Seventeenth-Century Metallurgy on the Spanish Colonial Frontier introduces a wealth of data from one of the few known colonial metal production sites in the Southwest. Archaeologist Noah H. Thomas draws on and summarizes ten seasons of excavation from the Pueblo of Paa-ko to provide a critical analysis of archaeological features and materials related to metal production during the early colonial period (AD 1598-1680). Extrapolating from the data, Thomas provides a theoretical interpretation of these data that is grounded in theories of agency, practice, and notions of value shaped in culture. In addition to the critical analysis of archaeological features and materials, this work brings to light a little-known aspect of the colonial experience: the production of metal by indigenous Pueblo people. Using the ethnography of Pueblo peoples and seventh-century European manuals of metallurgy, Thomas addresses how the situated agency of indigenous practitioners incorporated within colonial industries shaped the metallurgy industry in the Spanish colonial period. The resulting analysis investigates how economic, technical, and social knowledge was communicated, contested, and transformed across the social and cultural boundaries present in early colonial communities. Viewing these transformations through an ethnohistorical lens, Thomas builds a social and historical context within which to understand the decisions made by colonial actors at the time. 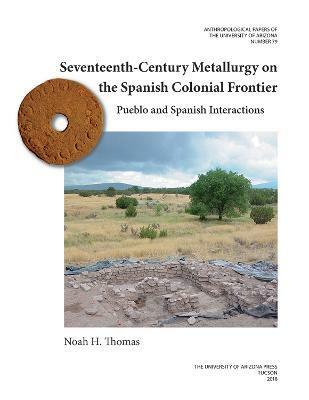 "Analyzing and synthesizing a wealth of data gathered by himself and others over ten field seasons at Paa-ko, Noah H. Thomas provides a rare perspective on the development of seventeenth-century metallurgical practices in the context of both the Spanish Colonial and Pueblo worlds." --Teresita Majewski, Statistical Research, Inc.
Noah H. Thomas is an archaeological/museum consultant for the City of Ventura Cultural Affairs Division. His research examines early colonial interactions in New Mexico and the development of metallurgical practice in seventeenth-century New Spain and among the Pueblo peoples of the Southwest. Thomas received his PhD in anthropology from the University of Arizona and has received grants from the National Science Foundation, the Arizona Archaeological and Historical Society, the Mellon Foundation, and the American Council of Learned Societies.